New plug-in for Photoshop and Aperture incorporates proprietary U Point Technology for precise selective tonal and contrast control. Nik Software showcases today at Photokina 2008 the new Silver Efex Pro photographic plug-in for use with Adobe® Photoshop® and Apple® Aperture™, the most advanced, complete, and straightforward black-and-white solution. Silver Efex Pro uses a range of advanced imaging algorithms that protect against unwanted artifacts, a comprehensive collection of 18 emulated black-and-white film types, and a state-of-the-art grain engine that truly mimics the silver halide process and creates the highest quality black-and-white images possible from scanned or digital color photographs. With Nik Software's patented U Point technology, Silver Efex Pro provides easy-to-use tools for direct on-image control of tonality, contrast, and structure. Precisely controlling specific areas of a photo can be achieved easily using just a few mouse clicks without the need to create complicated selections and layer masks. Silver Efex Pro combined with U Point technology offers users unprecedented control over selective tonal and contrast adjustment in black-and-white images. Working seamlessly within Photoshop and Aperture, Silver Efex Pro begins by presenting photographers with a basic “neutral” conversion of their color image to black-and-white. One-click adjustments can be made from a choice of over 20 preset styles from nostalgic processes like the ambrotype and tin type to classic artistic renderings, trendy high contrast, soft focus or grainy images that emulate the most popular film types and shooting styles. This initial set of creative options can be used as is or as a starting point for photographers who wish to create and even share their own customized black-and-white styles. In addition, color filters, variable toning controls (includes sepia, selenium, split-toning and user-defined colors for maximum flexibility), vignettes, and more only add to the number of advanced stylistic effects photographers will enjoy with Silver Efex Pro. Additional sliders for global brightness, contrast, and structure, as well as Smart Filter compatibility within Photoshop and multi-image support in Aperture provide the ultimate level of control. With U Point powered Control Points photographers have the flexibility to specifically fine tune tonality, contrast, and structure and create stunning black-and-white images. 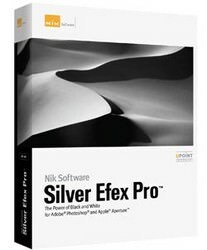 Silver Efex Pro is available now for electronic delivery directly from Nik Software. Boxed versions are available from Nik Software and through specialty camera retailers. The suggested retail price of Silver Efex Pro is $199.95. Silver Efex Pro installs as a plug-in for either Adobe Photoshop or Apple Aperture 2.1 and is available for Windows and Macintosh operating systems, including Vista and Leopard. For more information about Silver Efex Pro, including video tutorials showing the software running within Photoshop and Aperture and a free 15-day fully functional trial version, please visit here. I've just downloaded the trial version of Nik Silver Efex Pro, not expecting much. However, I have to say, I've used it constantly for about two days, and if I were able, would totally use it on my entire back catalogue. It's so user friendly, and has so many options, the variations are endless. You might think it expensive, but I think it's one plugin that, if you are a dedicated mono enthusiast, you will use it over and over again. I'm convinced.